It's often suggested that hard times force businesses to re-focus their priorities and that economic pressures often produce a leaner, fitter company with a renewed appetite for the challenges to be faced and a more keen-eyed purview that scans horizons near and far to find new opportunities. There's often a simultaneous winnowing effect, which sifts out the weaker players and produces a tougher, sharper supply market offering a better deal to the customer, be it in prices, service, technical support or innovative products. Donegal-based McMonagle Stone have had to weather the most exceptional of downturns in the construction industry in Ireland and with a sizable chunk of their business originating in Britain, it's not as though there has been much respite outside their home market. There had to be significant changes. The workforce has had to bear some heavy losses, being halved in just a half a decade. No more of the bullish enthusiasm of the Celtic Tiger years, but a more judicious re-appraisal of their market and an acknowledgement that if you want to be a successful stone dealer in the second decade of the 21st century, you have to look far beyond your own borders, venture outside that familiar comfort zone, and put yourself on a world stage. They looked east and saw opportunities in Eastern Europe for stone building systems, and they looked west to identify a US-origin machine that could manufacture specialist cladding from their own reserves of the finest Donegal Quartzite. And there they sat, right in the middle. Out of this came Stoneer, the awful name being a portmanteau of Stone and Veneer. Stoneer is a simple yet versatile cladding system that provides a truly authentic and original stone façade to any existing structure. 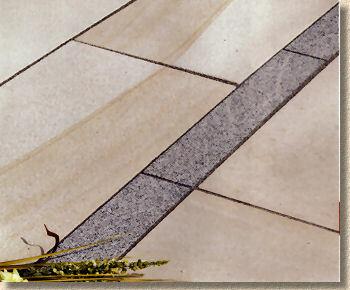 Now, it is possible to have the soft, warm tones of the quartzite out of a box, with all the hard work done for you. You can have other iconic Irish building stones such as Liscannor Slate or Blue Limestone, if you prefer, all working on the same principles. Stoneer is a 30mm thick veneer which is fixed to a wall using an adhesive (Ardex), but what makes it special are the full depth corner pieces or 'quoins', L-shaped stones that are positioned first and, when completed, give any wall the appearance of being solid stone. Stoneer comes pre-selected with half a square metre in a box, and with every piece being genuine stone, not reconstituted, not repetitive. You will not find two identical pieces and the finished effect is pretty bloody amazing. The corner sections which give the system its real advantage, come in packs with sufficient stone to create a 1m run. The stones is capable of being used indoors or out, and when built it's hard to believe a completed chimney breast or conservatory dwarf wall is NOT full thickness stone. Stoneer is doing reasonably well in the Irish and British market, including a prestigious order to provide the system to the new Irish World Heritage Centre in Manchester. However, the interest from Eastern Europe, where similar but less naturalistic systems are more common, has been little short of phenomenal. 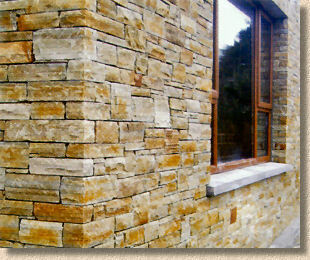 Imagine: Donegal quartzite adorning the homes and gardens of the former Yugoslavia, Poland and beyond! The system is also available in Britain and it has potential beyond the usual indoor focal point such as a fireplace or archway. It can be used to give genuine character to full-height walls, add a feature panel to garden designs, and bring a touch of natural charm to most vertical surfaces. 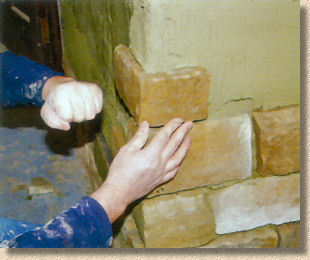 But that's not all McMonagles have been doing, not by a long way! They've also re-vamped their landscaping range, with a renewed focus on their greatest asset: the native stone of Donegal. 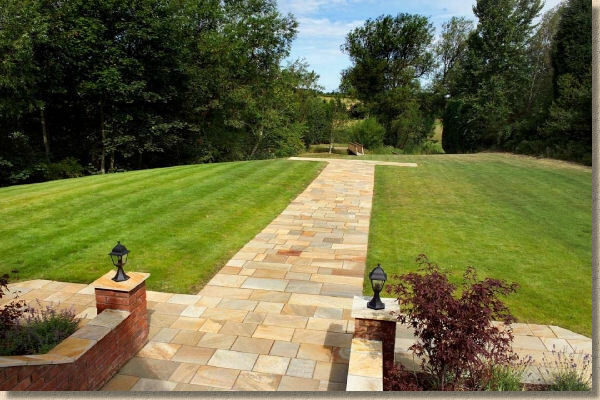 The unmistakeable warmth of the exceptionally tough Donegal Quartzite is available as gauged width rectangular flagstones or as polygonal 'crazy' paving. Quartzite has a gently riven surface which sparkles as the light bounces off the mineral facets. It's low water absorption help it remain cleaner for longer, and its high flexural strength mean it can be provided in thickness down to just 10mm (for internal applications). 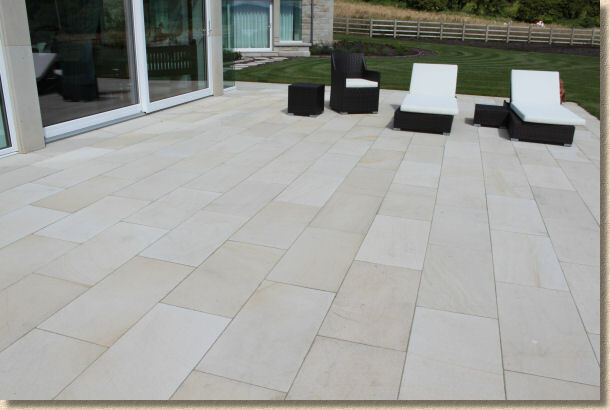 Also from Donegal comes the beige-biscuit hued natural sandstone, with either a honed or a bush-hammered finish. 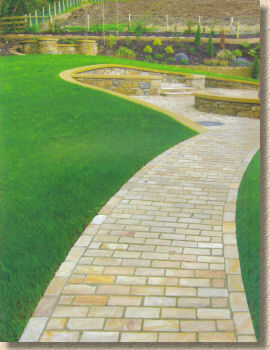 Again this is available as 400mm gauged width flagstones although bespoke sizes are available on request. This is a modern looking stone, very light in tone but crisp and cool. 30mm is the standard depth but other thicknesses are available if required. Of course, they've kept the 'best sellers' from their residential range, so there's the usual suspects in sandstone and limestone from India, along with Chinese granites. I'd have liked to see more made of the setts, even though they don't sell in the same volumes as flagstones in the Irish market, but there has been some lovely work done using setts supplied by McMonagle and it deserves wider recognition. 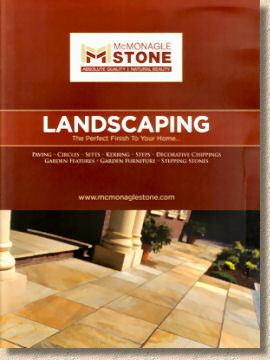 It's hard, and possibly a little unfair, to compare brochures from Irish companies to those provided by manufacturers and suppliers in Britain, because the markets are of a completely different scale, and you cut your cloth accordingly, but the latest Landscaping catalogue from McMonagle Stone is a good effort that will work in both markets. The focus is very much on photos, and there's something warm and reassuring about the firebrick red corporate colouring of the brochure with the rich hues of the quartzite featured on the cover. The text is sparse, but there's sufficient technical information to give a feel for what's possible. It's noticeable that native Irish stone is flagged up (Oh! The wit!) as such while stone from Asia is left undeclared. There's no harm or detriment in revealing that, for example, Modak comes from India, or Silver Granite from China. Many of us know it and looking at the way imports have taken over the paving trade over the past decade, the buying public either don't mind or don't care. Installation and aftercare, the two topics which seem to dominate 90% of the enquiries to this website, are touched upon, but no more than that. I can appreciate that it's not always best to get installation advice from a retailer, after all, we wouldn't ask spotty Darren in Comet how to plumb in the new washing machine, but given the sheer number of questions that arise about sealants, cleaning, stain removal, and algae, a little more reassurance on that front would probably be appreciated by the target audience, the homeowners and DIYers of Ireland and Britain. Thankfully, the photos are impressive enough and it's good to see that staginess of some recent publicity shots from bigger companies has been eschewed. These are real photos of genuine works, and as such the quality of the products, and the workmanship, has to be strong enough to tell the tale. It is.